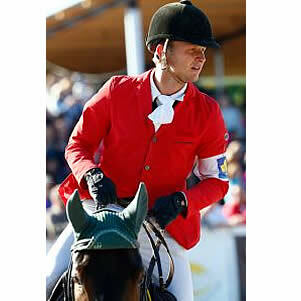 The Czech rider’s notable results during November 2012 all came at the CSI3*-W Leszno (POL). Riding his grey gelding, Nobel, Opatrný finished third in the competition’s Medium Round Final class; fourth with his chestnut stallion, Zandiro in the 1.50m Big Round class; fifth riding Zandiro in the 1.45m Big Round class; and second with Nobel in the 1.50m Big Round class. Opatrný’s most recent noteworthy result came at the CSI2* Celje (SLO) where he finished fifth in the Grand Prix with Zandiro. January 2013’s Rolex One to Watch will be announced at the beginning of January 2013. To view the Rolex Rankings online, please click here. • Christian Ahlmann (GER) is currently ranked number one in the Rolex Rankings and therefore holds the Green & Gold armband which bears the words “Number 1, Rolex Rankings”. • Christian Ahlmann shall wear the Green & Gold in all competitions whilst he is the Number 1 ranked rider in the Rolex Rankings.